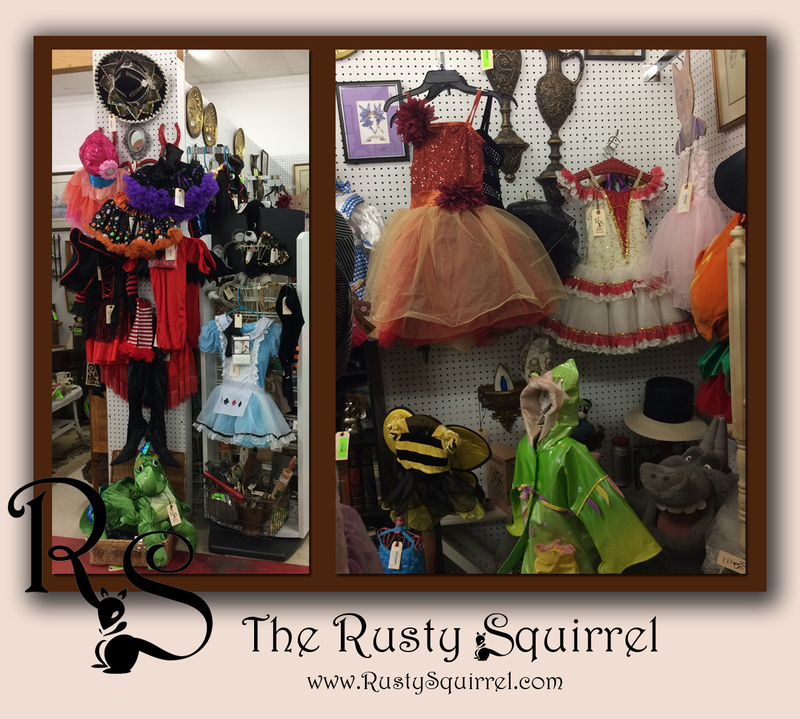 I've been packing up summer items from my booth and getting ready for the festive season of Halloween. I love costumes, plain and simple. I loved them as a kid and I still love them as an adult. It's just so much fun to play dress up no matter your age. Yes, I know it's only September; however those of you who love costumes understand that sometimes it takes a bit of time to pull together the right look and it never huts to get an early start. 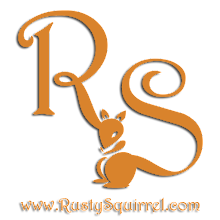 Now, being a costume lover myself, I'm constantly on the lookout for articles of clothing that can create an amazing costume. Here is an example of 3 items that would be great at Halloween or other dress up events. The little girls Medieval dress would be great at a Renaissance Faire, the dance dress and vintage hat in the center screams Tango Time and the Robe from Japan is yummy enough to be a great dressing gown when not in use for costume wear. 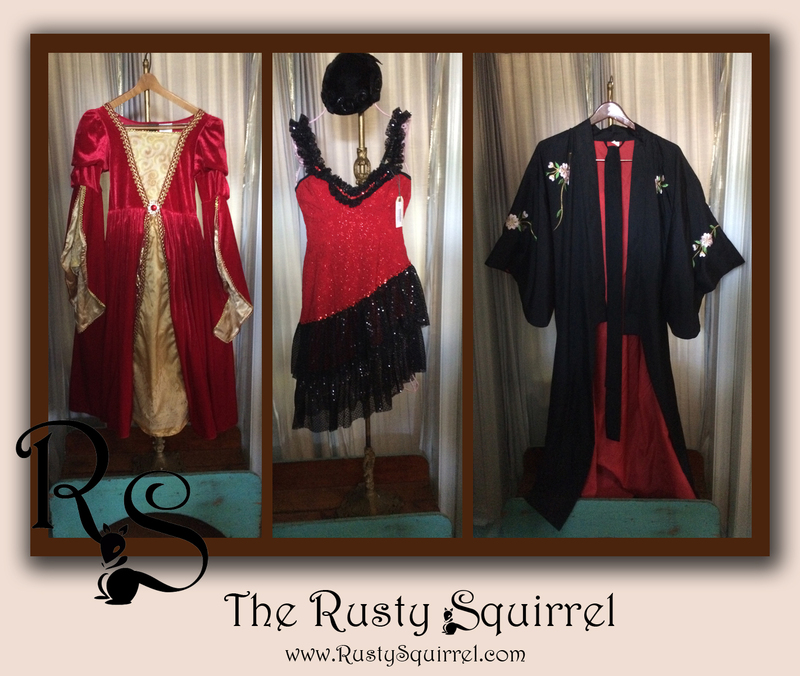 I started placing costumes in my booth last week and though many have already sold, these three beauties are still available. 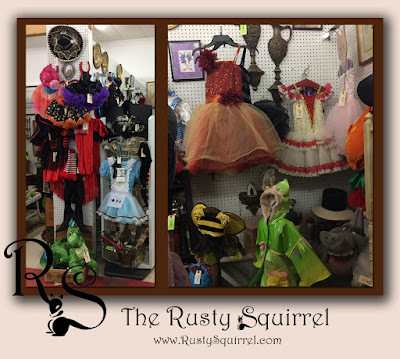 Dresses, tutus and accessories - Oh my. I've already had 10 costumes to sell in just one week, so it seems there are other costume lovers like myself out there who snap it up when they see what they want. There are several Comic-Con events coming up in our part of state over the next few months, so I would not be surprised if some of the costumes being purchased are for one of those events. The kids Top Gun Flight Jumper already sold but the great Hook Pirate outfit is currently available. I can see that jacket and hat being used for Colonial reenactments as well as pirate ware and who wouldn't like to play pirate? 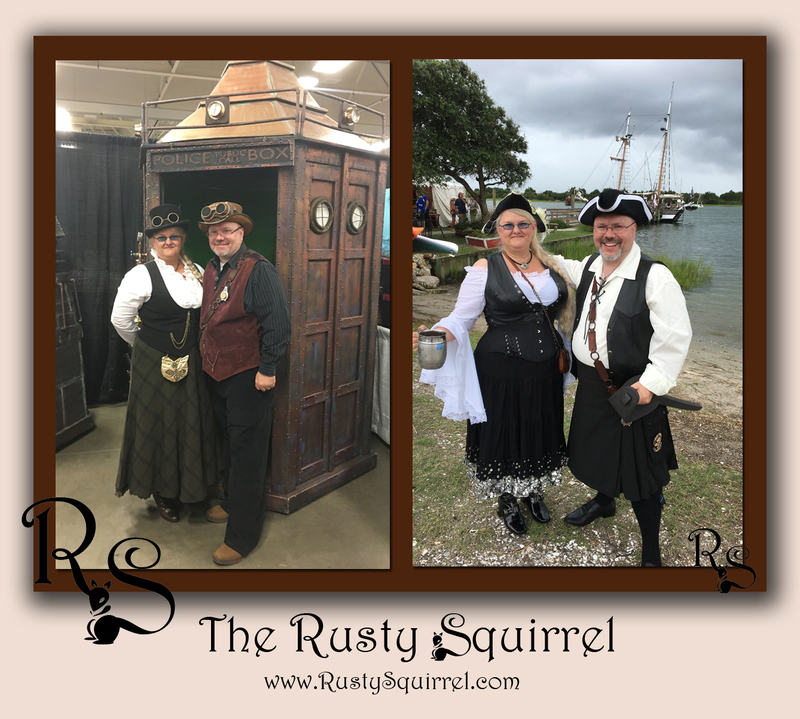 Last month my husband and I attended the Pirate Festival in Beaufort NC and had a blast. Being a lover of costumes we joined in the fun by dressing up and were amazed at the number of folks who did likewise. 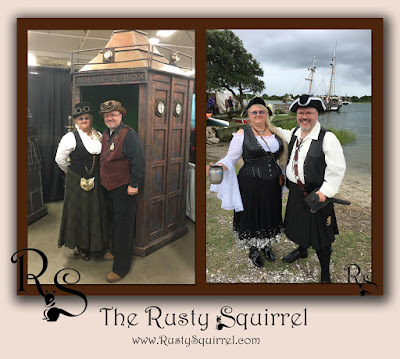 Normally when we attend dress-up events we gravitate to Steampunk costumes but we had a blast playing Pirate and can't wait to do it again. I think we might try a Ren-Faire in the near future since I have a desire to be a medieval wench for the fun of it. 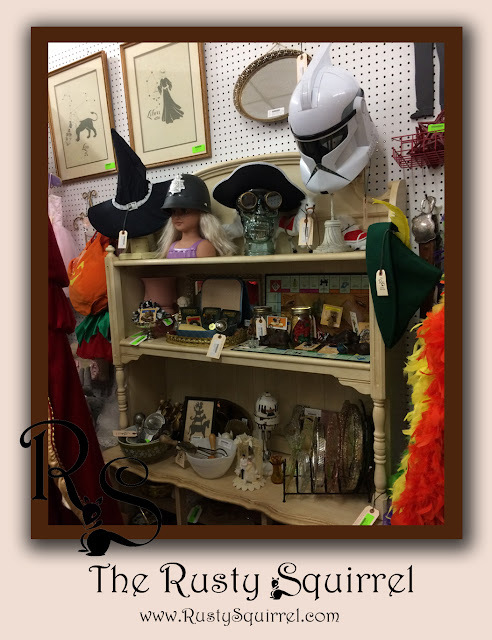 From kitchen glassware and gadgets to Star Wars Collectibles, there is lots to see. I think it's amazing how a hat or a special accessory item can make a costume "work". For instance these glass skulls are really nice on their own but add a hat and some funky eye-ware and they really showcase great. Here is a look at my collection of glass skulls. I use them to display hats and accessories; however, they can be purchased if you find you can't live without one in your collection too. Right now I have the clear one in my booth with the goggles and a pirate hat and the orange and blue skull are at my showcase with my military hat items. 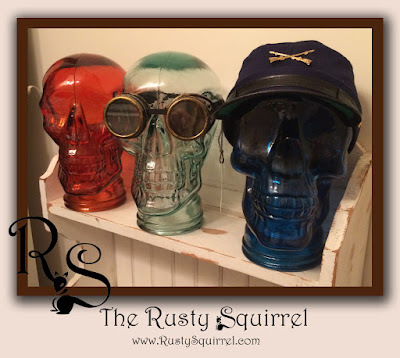 Here is a photo of the showcase with the orange skull wearing a vintage 1950s Pith Helmet and the blue skull is sporting the blue Federal soldier cap. 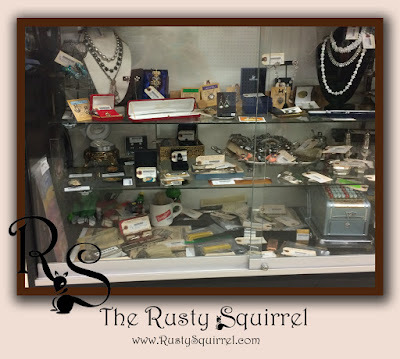 I've re-worked my showcase and it's now full of vintage items and jewelry pieces. 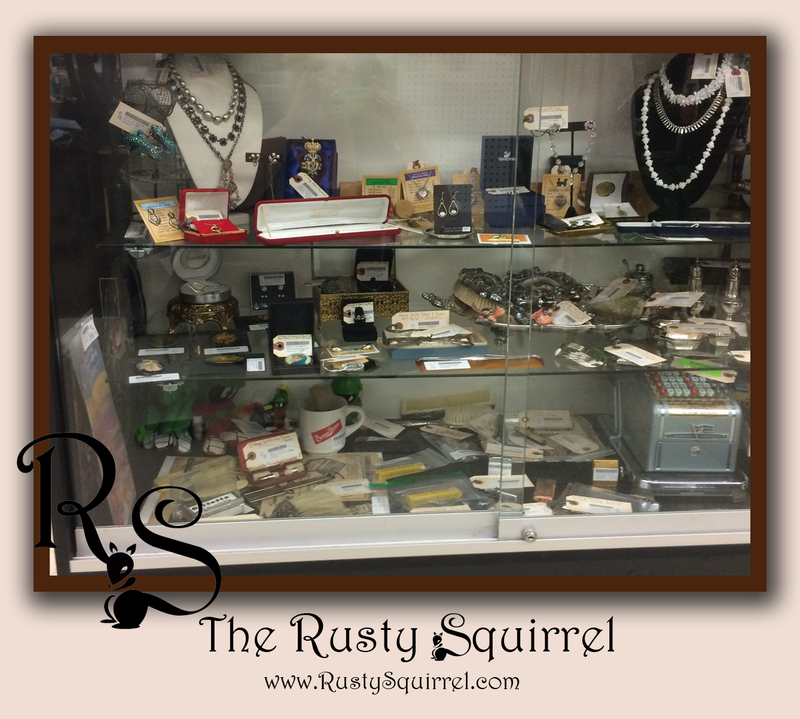 Most of the showcase has vintage jewelry, including some great Victorian Sterling items. There is also some Sterling tableware and some unique collectibles scattered within. 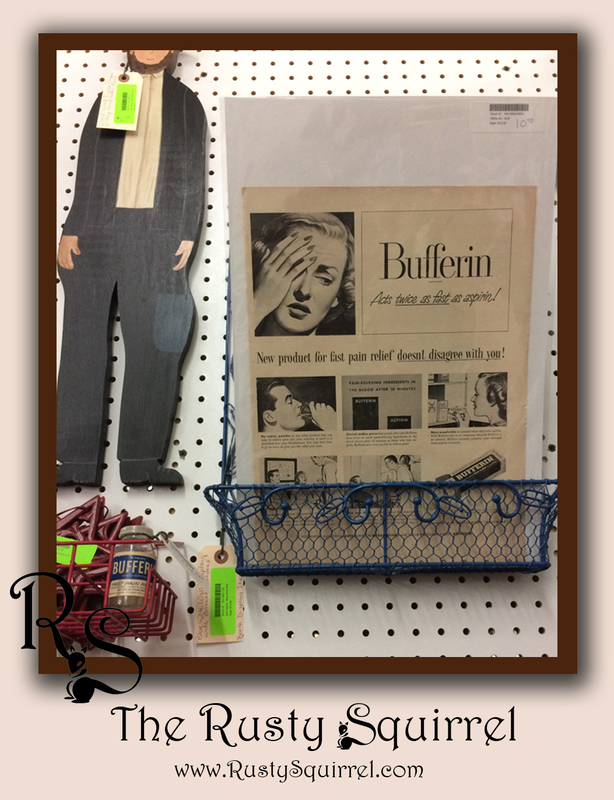 There are also some vintage paper products like old advertisements and a 1950s Military training poster. 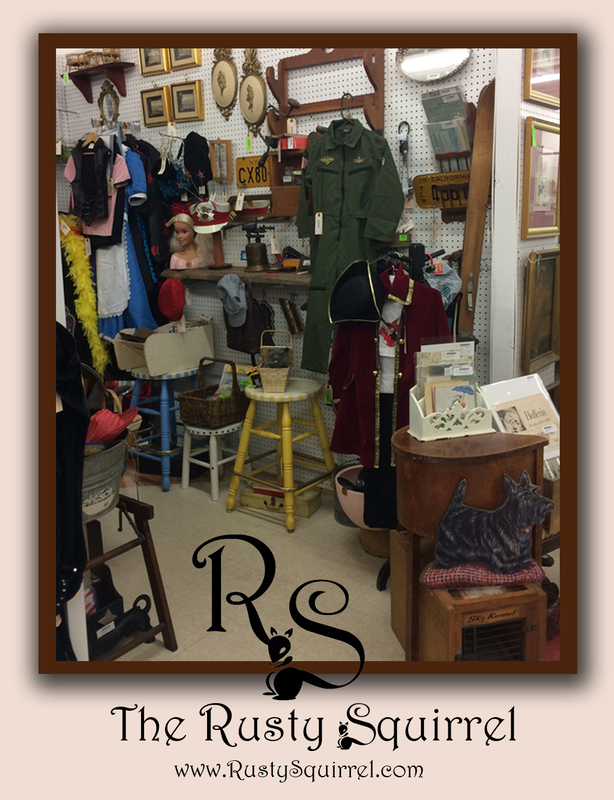 Vintage paper collectibles are one of my favorite things to collect and I'm starting to add some of these items to my booth and showcase for sale. Here is a mid-Century ad for Bufferin and if you look over to the left a bit you'll see a vintage Bufferin Bottle. I think it's so cool when you have a vintage ad to go along with the actual vintage item. In my showcase I have a vintage Schick ad and Schick razor and blades. Back over in my booth I have a variety of 1940 - 1960s magazine ads from Beer to Coca-Cola Santa's. There are also a few early 1900 paper dolls in there too. But hands down my favorite new add to the booth is the vintage baby doll buggy. 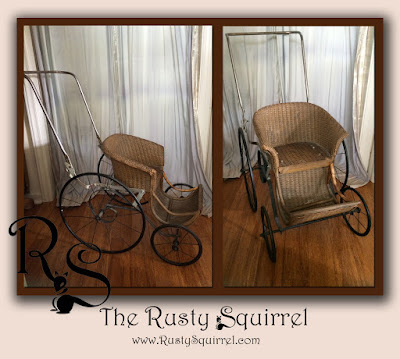 I just think this one is a total charmer and though I purchased it as a display item, I have a feeling someone will buy it before the New Year rolls round. 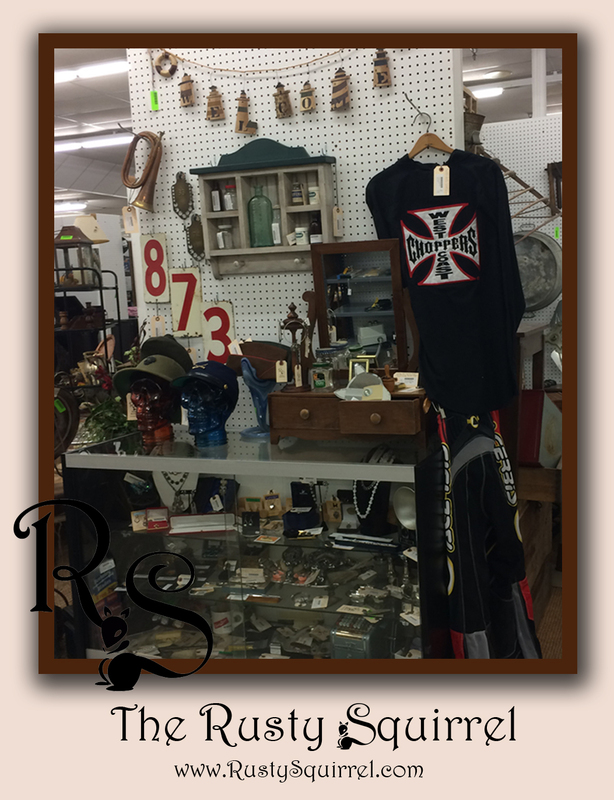 Hope you guys drop by Booth 48 and Showcase 21 at the Countryside Collectibles and Antique Mall in Siler City, NC if you happen to be in the area and are looking for a fun place to browse.